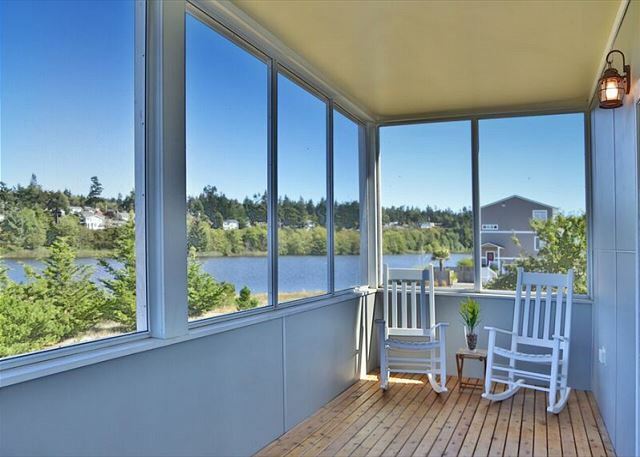 Newly constructed 3 bedroom, 2.5 bath home, with spacious open floor plan, master balcony overlooking the Sound and Olympic Mountains, and large screened veranda overlooking Admirals Lake behind the home. Located across the street from the beach, with easy access to the beach a short walk down the quiet road, this home is perfectly situated within a few miles of the Port Townsend ferry, Fort Casey, Admiralty Head Lighthouse, Ebey's Landing nature reserve, and the historic town of Coupeville (with Wharf, shopping, and restaurants). 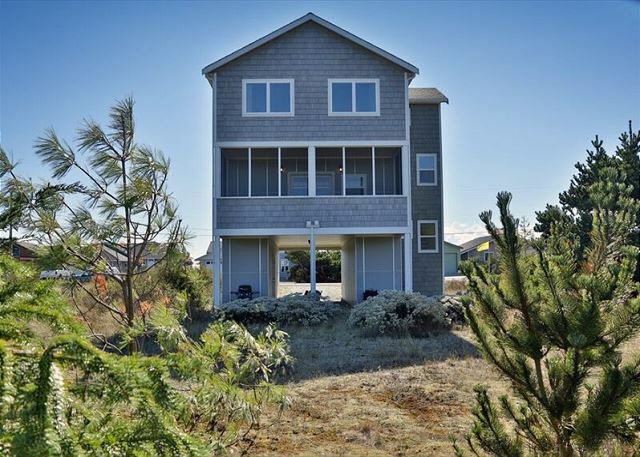 This three-story cape cod nautical style home with over 2,100 square feet sleeps 6 comfortably in a king, queen and 2 twin beds, plus sleeps an additional 2 on each side of a large sectional sofa. 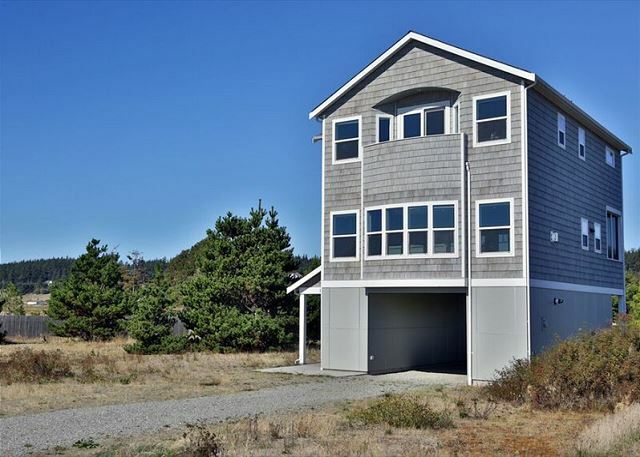 Bathrooms are located on the upper level next to the bedrooms (half bath in the lower entry level) and include large walk-in showers and a beautiful claw foot tub overlooking the Sound. Home also includes a large kitchen island, stainless steel appliances, filtered water tap, ice maker, dishwasher, washer and dryer, microwave, toaster oven, coffee maker, rice steamer, bread maker, clothes iron, blow dryers, gas BBQ grill (not available during the winter months), cable TV, DVD player (various movies provided), WiFi, gas fireplace, and smartphone/ipod docking station music player. 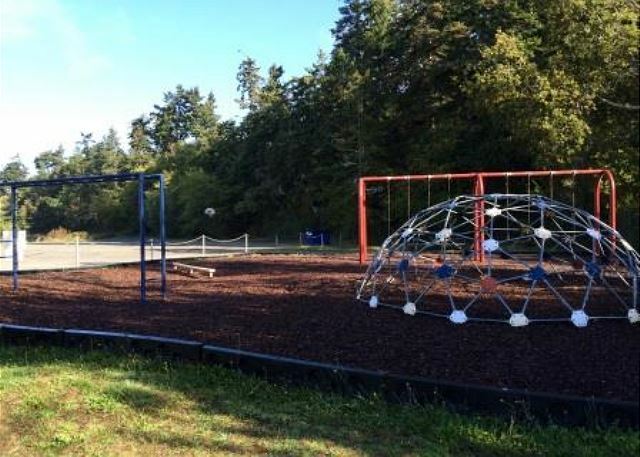 Playground, basketball court, picnic table area, and bonfire area on the beach are also available at the end of the street. Bring your yoga mat for a peaceful workout on the veranda, or just kick back and relax in one of the rocking chairs. Go for a morning jog on the flat level street towards the Port Townsend ferry dock or up the hill behind the lake. Ceiling fans in each bedroom keep them cool during summer nights, while the large gas fireplace keeps things warm and cozy during winter nights. OCCASIONALLY, PER THE NAVY'S SCHEDULING, THERE CAN BE FLYOVERS AROUND THIS HOME. THIS HOME HAS A 4 NIGHT MINIMUM IN JULY AND AUGUST. 2 DOG MAXIMUM. It was great! Loved the house! So clean and beautiful inside. Lots of stairs!!! Great location. We enjoyed Langley and Coupeville and a few winery’s. There were 6 of us ladies, perfect amount. Thank you for your comments. We are so happy you had an "enjoyable" and "perfect' stay on Whidbey Island. We hope we can help you with your next stay on the Island. Thank you for your comments. We are so happy you had a "comfortable" and "great experience" visiting Whidbey Island and all it's sites (we love the Kettles Trail!). We hope we can help you with your next stay on the Ilsand, its a great place to train. We went 8 friends for the weekend, the house it is awesome although i have to say that it is perfect for 6. Overall the management company and the house was great. Thank you for your comments. We are happy you found the home you stayed at "awesome". We hope to help you with your next stay on Whidbey Island. We had a family reunion at this house, and it worked out well with the open floor plan on the 2nd level. The screened porch over-looking the pond was a nice place to relax and talk in the cool breeze. Thank you for your comments. We are happy your stay on Whdibey Island "worked well" for you. We hope we can help you with your next stay on the the Island. We had a fantastic time on Whidbey staying at this home. The views from the house are incredible and beach access was a short walk away. The kitchen was fairly well equipped (though lacked a kettle) and the bedrooms were very comfortable for our 6 guests. I wouldn't recommend the couch as a sleeping space if you're planning on having more than 6 people -- it had a tendency to drift apart. The bathtub in the master bath was a highlight... never have I been in such a comfortable tub! And you could see the water and the mountains while bathing. Deluxe. Thank you for your comments. We are happy you had a "fantastic" time on Whidbey Island. We hope we can help you with your next stay on the Island. The house was exactly as pictured and expected. Management was extremely helpful for several special requests. Would recommend staying here for large groups and working with the management company on any other properties of theirs in the future. Thank you for your comments. Thank you for your recommendation, we do everything we can to exceed expectations and happy you enjoyed your stay. 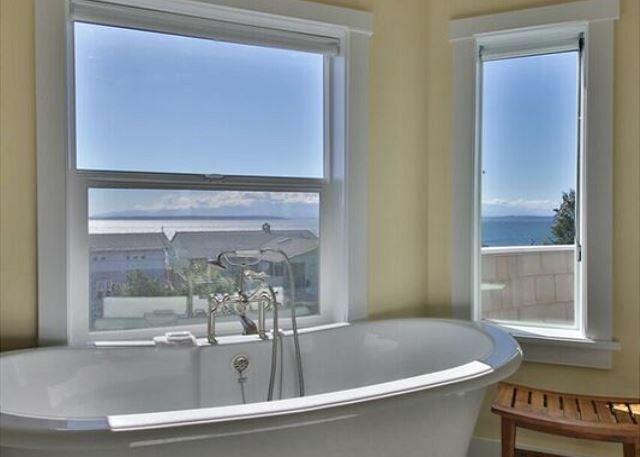 Please let us help you with your next stay on Whidbey. My sister and our husbands took my mom here for her 70th birthday getaway. We loved this place! The rooms were very clean, the bathrooms very modern, and the yard was very spacious. The large pond was a gathering place for migrating Canadian geese and various other birds that we watched from the lovely screened- in porch. The Puget Sound was just across the street. My puppy had a lot of fun running in the rock beach, and the husbands got in a little flyfishing for salmon also! The master suite had a cute balcony and large, deep tub and modern shower. The other two bedrooms were bright and spacious and had large windows and ceiling fans to keep us cool on the warm summer nights. The bathroom we shared was large and had modern fixtures and the same modern shower! Most of the main lights had dimmer switches associated with them to create nice moods for dinner and bedtime. The ground floor had the entrance and a bathroom and mud room. The second floor had a large open kitchen, dining, living room with a large flat screen TV. The only drawbacks were no bathroom on the second floor and lots of steps for mom to manage. Despite that, everyone loved their stay! I would highly recommend this property for a relaxing seaside getaway! Thank you for your comments. 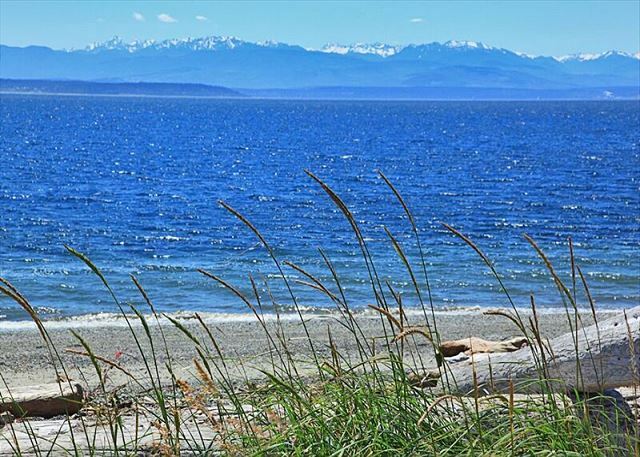 We are happy you "loved' you stay on Whidbey Island, we hope to help you with your next vacation on the Isalnd. Very nice and clean rental. Loved the beautiful views from the front and back of the home. It was only 5 minutes from the wedding we attended as well as a few hikes we went on. I would suggest having a few more plates, glasses, mugs etc. There were 6 adults and we hand washed everything because it was needed for the next meal. We only used the dish washer the day we left. A very nice and enjoyable stay. Thank you for your comments. We are happy you had a "nice and enjoyable" stay on Whidbey Island, we have passed on your suggestions to the owner of the house. We hope we can help you with your next vacation on the Island. Very nice location and accommodations. House was nice, clean, and nicely equipped. Unfortunately, the WiFi and cable TV wasn't working as advertised. This caused a working guest to have to leave early as he needed access for his work. Tara Vacation Rentals was proper enough to reimburse 1/2 day's rental cost to us for this inconvenience. Satisfied. Thank you for your comments. We are happy that you are "satisfied" with your stay on Whidbey Island. We hope we can help you with your next vacation on the Isaland. Very comfortable house in a nice location on Whidbey. Quiet neighborhood with beautiful views and sunsets. Excellent layout, nice furnishings. Great value for the price. Thank you for your comments. We are happy that you enjoyed your stay on Whidbey Island, please let us know if we can assist you with another vacation on the Island! Beautiful house along the shore, great fishing and perfect weather! So glad you enjoyed your stay! Thanks for your review! My group absolutely loved this house! It had beautiful views from every window of the house and was exceptionally clean. We had 8 people in our group and were quite comfortable with the amount of space we had. 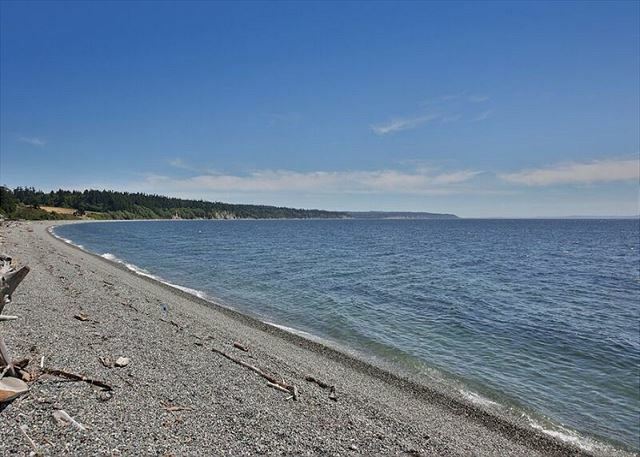 I would definitely recommend this house to anyone looking for a wonderful Whidbey Island home! Thank you for your review and feedback. We hope to help you with your future needs on Whidbey Island! We (2 families) spent two nights at 222 Admirals Cove Seaside beach house. It was a very pleasant stay. The beach house is very new and clean. Beach access is only a short walk. The is a small lake/logoon at the back of the house. The kiddos spent a lot of time there...catching fish, feeding the ducks etc. The view from the master bedroom is amazing. 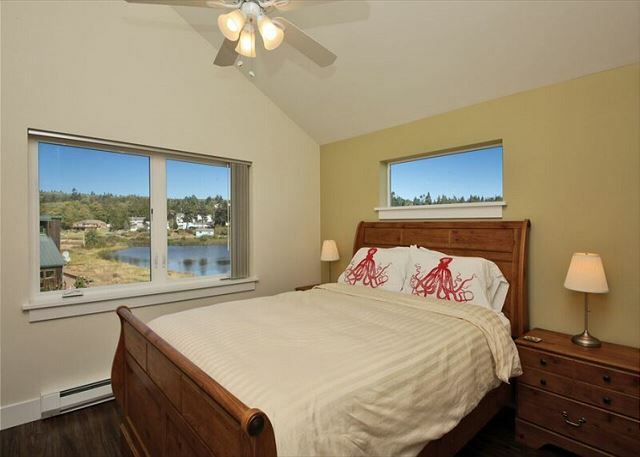 You also get the view of the lake/logo on from the other two bedrooms. Kitchen is well equipped. As for toiletry, they only supplied bath soap. Please bring your own shampoo and conditioner. We had a great time and already planning a trip back. This property is perfect with family with children. I'll not recommended family with elderly as there are many stairs. Other than that, you will love this beautiful beach house. So glad you enjoyed the home and the location. Thank you for your helpful comments, future renters will appreciate your advice! Thank you for your review! There aren't enough dishes and/or glassware. Coffee maker and knives were terrible. Since the girls didn't wear shoes in the house, they noticed the hardwoods were dirty. There is no guest book - which is something our group has always filled out with great delight. Our group searched to buy for the house but were unable to find one in Coupeville. Twin beds were wrapped in plastic and it was uncomfortable and hot - housekeeping should remove that for adult parties. All that said, we appreciated Marisa's efforts on our behalf. Thank you very much. Thank you for all of your helpful comments, I will be passing your suggestions on to the owner and the housekeeper, respectively. We're glad that you still enjoyed the home. Thank you for your review! Our stay was very nice. We did have one night of jet flyovers until 10:30pm, I know it is uncommon but worth noting, they were right on top of us. The house itself was in great shape and very clean. We're glad that you enjoyed your stay! Yes, it's good for our guests to be aware that there will be occasional jet flyovers when staying at this house. Thank you for your review! House was everything we expected and more. Very functional for a rental unit. So glad you enjoyed the house! Thank you for your review! *Great place - great location! *If it's described as "Sleeps 6" like we had in our group, there could be several more with no problem. *Though I would definitely rent it again, the yard looks like it could use a little love. Thank you for being so accommodating and easy to work with. The place is beautiful. I am big on yards for appeal as well. We even talked about making a work weekend out of it with our group to do some landscaping there! But the house is a bigger deal, and it is fabulous. Very comfortable, welcoming, bright and cheerful, and well stocked with dishes, towels, etc. Thank you so much for your review. We're happy to hear you loved this home and that you had a great time. We really wanted a place where we could hang out with friends and our dogs. Had a lot of rooms to hang out in. Lots of good views of the water. Close to everything. Nice to hear you had a great time with friends and pets. Thank you for your review. We rented this house to spend Christmas with our grown kids and grandson. The house was very modern and spacious. Beautiful view. We enjoyed nice walks in the neighborhood to the beach. Kitchen was stocked with all the tools we needed. The fireplace was wonderful for the cool December days. Grocery store wasn't far away when we needed to get a few forgotten items. All in all a great trip in a beautiful comfortable home. Thank you! Nice to hear you had a great holiday here on Whidbey Island. Thanks for your review. We enjoyed our selves. ALL THAT WE EXPECTED! The only thing missing was automatic DW soap. Nice to hear you had a great time. We have addressed the soap issue. Thank you for your review. This is a beautiful newer home with just a few flaws. Kitchen butcher block top impossible to keep dry/clean as requested in instructions -- poor material choice on part of designer. Dining floor had a protrusion to hold patio door open -- very dangerous location and serious trip hazard. We covered it with a bright red cup to remind us to stay away from it. One upstairs bathroom has NO COUNTER SPACE so very hard to get ready in that bathroom!! Easy to remedy so hopefully owner will take action there!! Showers are beautiful and modern but impractical. Other than that a great home and the 6 of us had a great stay there!!! thank you for your review. Glad you had fun on Whidbey Island. We had a great stay at Admirals Cove. People at Tara Properties were awesome to work with and the place was well located and clean. The one thing I would check on is the schedule of the navy jets practice flights and make sure you are on a different part of the Island at that time. They fly right over the house and it was super loud and lasted about 3 hours. Master bed could have been a bit more comfortable. Other than that, stay was fantastic. Thank you for your review! We're glad you enjoyed your visit to Whidbey Island. I loved staying here. The views from the third floor bedrooms are breathtaking, especially from the master. The house is very nice and has all of the basics so you don't need to bring anything besides food and clothes. The town of Coupeville is very charming and is very close to the house as is Fort Carson. I would love to stay here again. We're glad that you enjoyed the breathtaking views and that the basics provided in the house met your needs. Thank you for your review, we're glad you enjoyed your stay! We had a great stay at Admiral's Cove. Better weather we could not have asked for. Great local eats and attractions. Would love to come back! We just finished a 7 day stay on Whidbey Island using Tara Property Management. We were very pleased with the two places we stayed, the services provided, and the beauty of the Island that was unknown to us. I would highly recommend this opportunity to others who are looking for good properties to enjoy scenic views, an abundance of wildlife, wonderful restaurants and other amenities. The house is gorgeous with beautiful views. It's modern, clean and well appointed. You can walk to the beach and are a shot drive to town. We had a perfect weekend! We're so glad you had a great weekend! Thanks for your review! Thank you! We have noted this to the owner and will try for an earlier date for outdoor furnishings next year! Really enjoyed our stay. Property nearly new and very well built. Beach access was not an issue for us since we spent a bunch of our time on the public beach to the north. We would definitely come back. There were only a few things we'd suggest for improvement. The place was pretty short on cleaning supplies as there was only a broom and dustpan to clean wood floors and the floor was pretty dirty when we got there. There is only one small garbage can and since there were 6 of us for a week we quickly overwhelmed it. Since Island County has an excellent Recycling Center just up the road, recycling bins would sure help to reduce the throw away garbage. Also a bit disappointed that there was no lawn furniture so it was not practicle to sit in the yard. Luckily, they have an awesome screened porch upstairs. Otherwise, 2 enthusiastic thumbs up on our stay! We had a 7 person vacation and thoroughly enjoyed this property for how well it was designed with a VRBO family in mind. It was set up very well for cooking, seating and sleeping. It is spacious and close enough to everything and seemingly far away. We came to Whidbey Island for a wedding. We were not sure what to expect and were so pleasantly surprised!! What a wonderful stay. Wonderful Island, Beautiful house and great location. The only thing I could complain about would be that the windows were not clean. The view was just so pretty, but the dirty windows obstructed the view. The enclosed patio was great, but the screens really needed to be cleaned. The house was quite beautiful. Much better than in the pictures. The space was more than adequate for our three sons, spouse and two grandbabies. This was our annual Fourth of July celebration. We normally seek a waterfront site for safe use of fireworks. That is the only drawback of this location. It's not on the water and it does not have beach rights/access. Very adult oriented. It was our grand daughter's 4th birthday. We ordered a bouncy house. The property has no grass/yard to place it on. But it worked out ok. That is the only drawback with regard to the property. Wonderful stay - beautiful rental. Clean, well furnished and comfortable beds! Wonderful house and beautiful location. I wish I could have stayed longer. Our family of 3 stayed at the house for 2 nights with another family of 3. House is very clean and plenty of room for 6 people. It is only a short drive to Fort Cassey and Coupeville. Had a lovely time in this house! Everything was clean, comfortable, and the views were amazing. The provided linen and towels were good quality, the kitchen was stocked with the basic equipment, and the hot water was manageable with a little creativity. Really liked the tub in the master bath! Just bring your own seasonings and a sharper knife for cooking. There were six of us getting together for a birthday weekend/mini vacation. We enjoyed the house and loved the island!